Sun Balm is coming! After 6 years in development, more than a few growls and tears, we are finally able to bring you this NATRUE certified natural sunscreen. It is high performance and a joy to use. We’re just getting onto store shelves this month, and will start celebrating in mid November. Goodbye says hello to some space. After 19 years working from our home. And the last few years getting increasingly ridiculous on the use of lounge, hall, dining and sometimes even kid rooms., we have a business location in Kerikeri! The has now been claimed back from the desks and boxes. Within a week we wondered why that took us so long to make it happen. 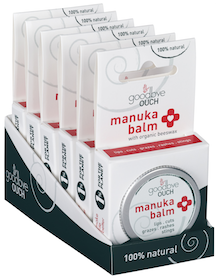 It took a few years, (and a few no’s), but Goodbye OUCH Manuka Balm is now ranged in most Countdown stores in the country. The brand update begins going into stores this month. Becky becomes an Activator for the first New Zealand Group of SheEO, supporting women business owners with interest free funding and support. With the inclusion of the SANDFLY 150ml in both Foodstuffs groups (PakNSave, New World and Four Square) and Progressive (Countdown, FreshChoice and SuperValue) we have established SANDFLY as a mainstream brand that people can expect to be on shelf in any grocery store. Here’s a clip of article that Supermarket News published. As a family business, our business has to flow around the framework of a thriving, active family. Sometimes that means things take longer than you’d expect. For example, the re-launch of the OUCH 12g- took, truthfully 3 years. One year to accept there was a barrier to getting the product on shelf, one year to consider our options and one to actually create a response. The Register picked up the story of the process of adjusting the OUCH packaging. 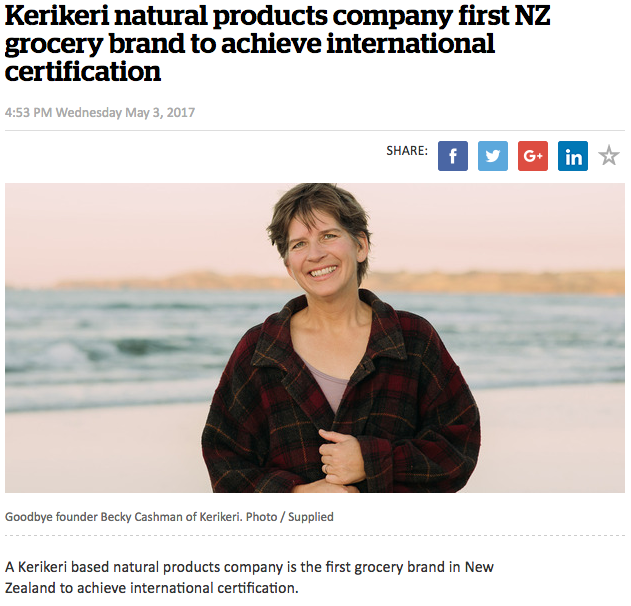 It took us awhile to realise this, we are the first grocery brand in NZ to achieve NATRUE certification. Sunday Start Times ran a story about the Health and Beauty industry confusion over the un-regulated word “natural”. We were quoted based on our NATRUE certification. Our April press release got picked up by Supermarket News, and our local Northern Advocate. Becky went to Taupo with Goodbye as a supporting sponsor of the Whai Ora Spirited Women’s Adventure race which saw 1200 women in teams of 4, navigating a multi-phase race. What a commitment by all, the women and the organisers who put on a truly great event. Look forward to supporting next years event in the Opotiki area. 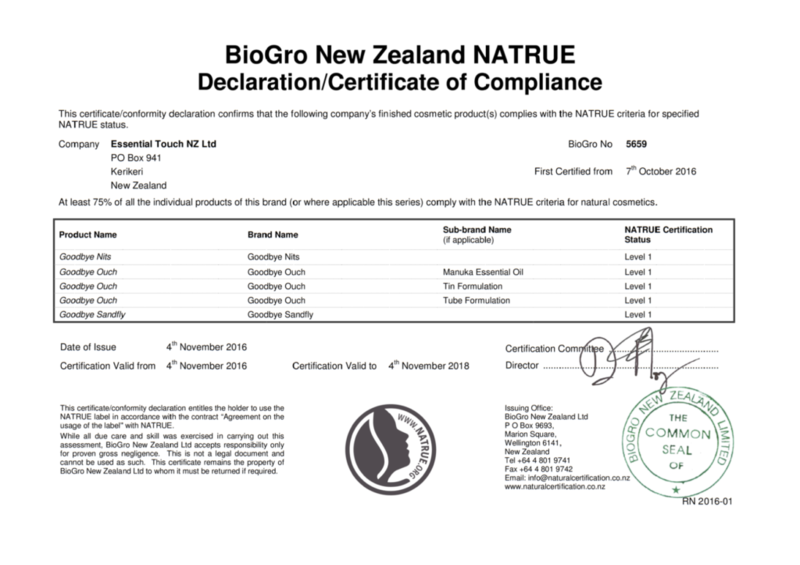 We are super glad to say that all products in all goodbye BRANDS are officially NATRUE certified through BioGro NZ. NATRUE is an internationally recognised and incredibly robust auditing system for certifying true natural cosmetics. This recognition gives you confidence in buying supremely beautiful, truly natural products. Below is our certificate!!! 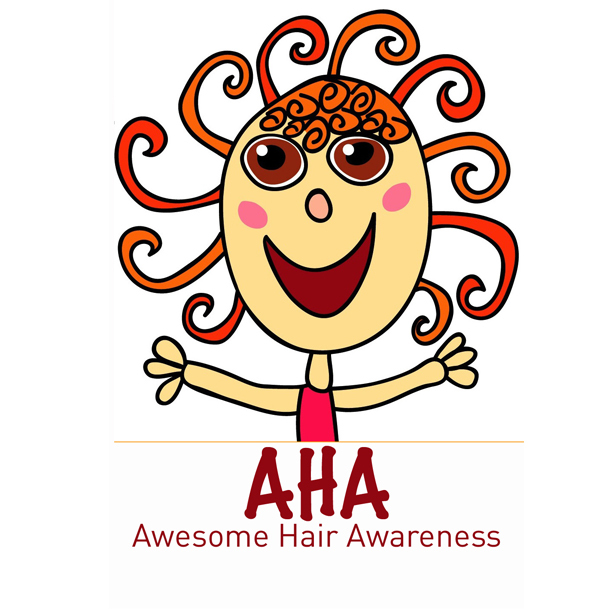 After 18 months in development, Goodbye NITS has begun working with a charter group of NZ Primary Schools to run a teaching unit called Awesome Hair Awareness (AHA!) The is a one week co-ordinated effort to get a positive conversation going so that dealing with headlice is easier. With the feedback from these 11 schools, AHA can be tested, refined and expanded in 2017. As the creator, Becky’s intention is that AHA will improve the culture of talking about and dealing with headlice in New Zealand. Goodbye OUCH launches OUCHLESS Blog as a landscape for talking about ingredients, product quality, consumer power, and making your own natural products. And always, it is linked to a connection with nature, with beautiful images and videos made from Becky’s organic property in Northland. Ramona Cording, also raising her family in Northland, and major fan of Goodbye OUCH, joins the blog as editor. 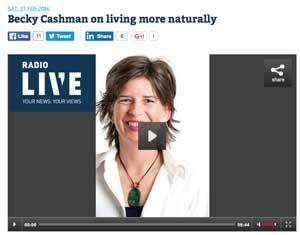 Becky gets to talk with Carly Flynn about the natural living and the trend to natural products on Radio Live. Four-year old Blog It’s Not About the Bugs (iNAB) has been rebranded to Outdoors is Good. The blog has grown in readership and social media influence and it was time to state our message in a more clear way. Outdoors is Good! NZ Business profiles Goodbye’s commitment to 1% of gross sales donated through 1% for the Planet. 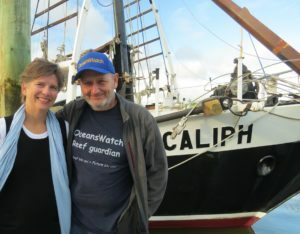 Photo is OceansWatch director Chris Bone and Becky celebrating Caliph’s “splash” after 5 months of work being done in the boat yard. 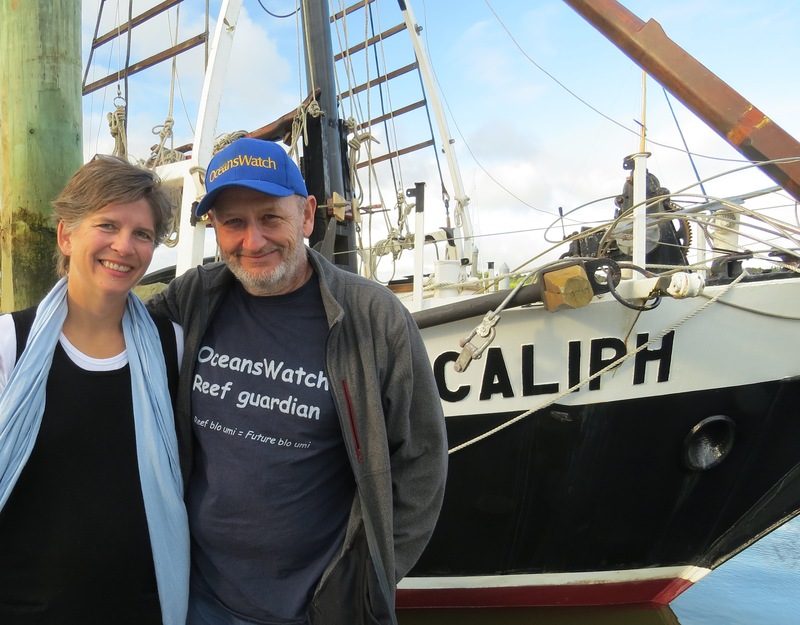 Caliph is preparing to go work in the Pacific Islands on behalf of OceansWatch. 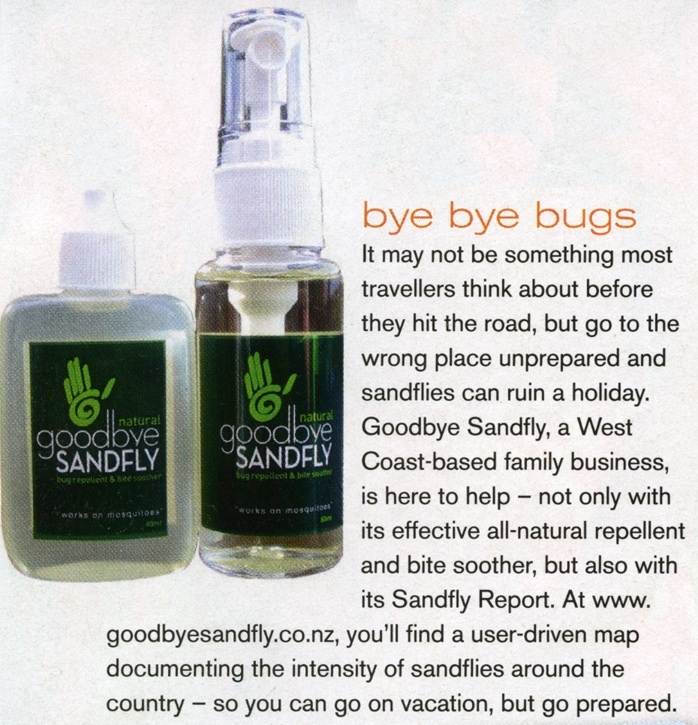 Sandfly Map and our Top tips for Dealing with Sandflies had us show up in 30 publications around NZ this season. Thanks to Liane Donovan of Donovan PR, she looks after us beautifully. Seed Celebration. 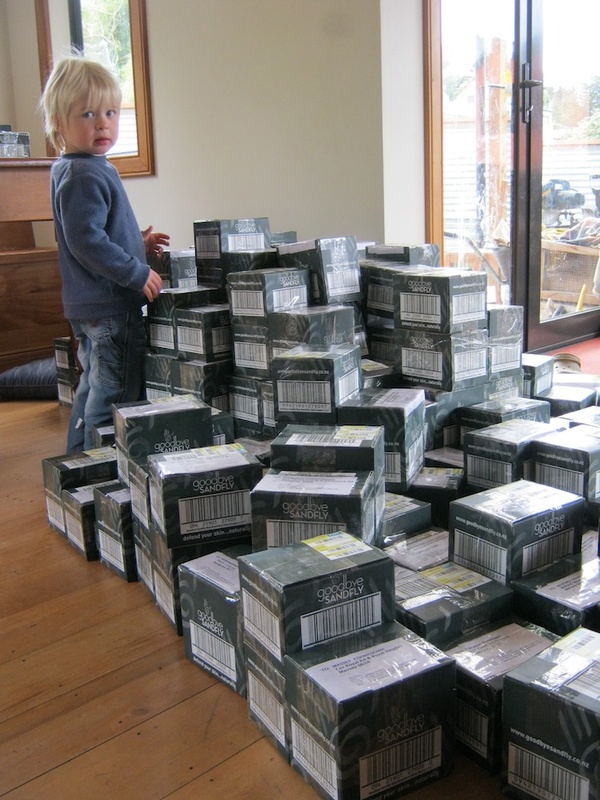 10,000 seed packets were given away to good homes in NZ. We have been giving seeds away since 2007, but this one was by far the biggest event yet. It was incredibly exciting to do. Goodbye PRODUCTS joins 1% For the Planet. Our chosen partner is OceansWatch, an international organization based in Whangarei that focuses on ocean communities, preservation and sustainability. We have been working with OceansWatch since 2012, and are very glad to formalize this relationship via 1% for the Planet. New brands Goodbye NITS and Goodbye OUCH are available in approximately 150 locations in NZ. Feedback is really good, and we settle in to build these brands with the attention and generosity we’ve given to Goodbye SANDFLY. Sister Brands Goodbye OUCH and Goodbye NITS are born. So exciting to see the Goodbye extension. These brands allow us to participate in a wider conversation with families dealing with the bugs and bumps of kids growing up. #1 selling natural repellent in NZ, again! And winner of Natural Products NZ James & Wells Excellence in Marketing Award for 2011. This is a billion dollar industry, pretty excited to be recognized for “generosity marketing”. Becky’s new book, Why Natural Matters plus 8 Simple & Positive Steps to Health is being launched mid February 2012! This coincides with the start of our new on-line shop for overseas customers. 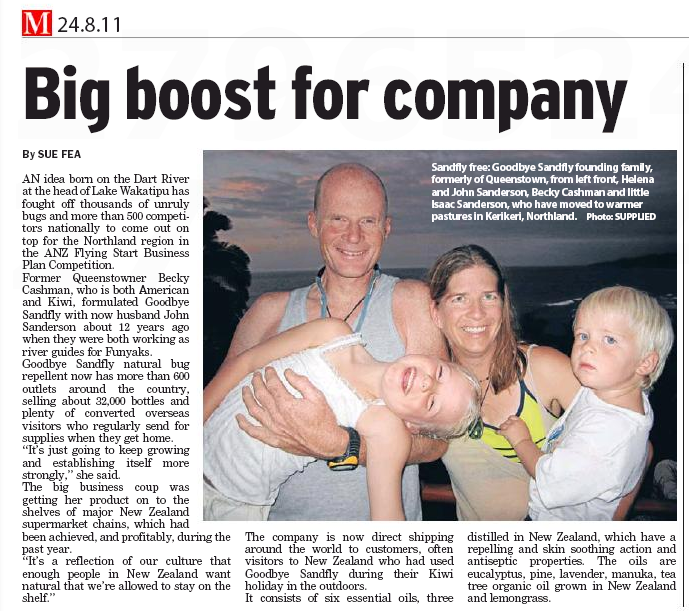 On December 2, Becky and Goodbye Sandfly were profiled in a one page article in the NZ Herald. 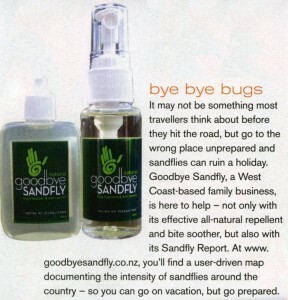 In July Goodbye Sandfly won the Northland Region award from biz.govt ANZ Flying Start Business Competition. We are grateful to see years of steady work gain some attention, because what we’re doing is not just about us, it’s about giving goodness to you. The new magazine, called It’s Not about the Bugs, has 10 expert contributors from all over New Zealand. Cashman, who is both American and a Kiwi has been in New Zealand for 15 years. “Since I’ve been in NZ, I have met the most skilled, awake, alive, & generous people. To me they are the essence of “good folk” and bring with them great hearts as well as amazing skills”, says Cashman. TV or Nature? Time watching television combined with the increase of computer use and mobile technology means we’re not outdoors as much. Yet, there is compelling evidence that we are better off emotionally, physically & even academically when we spend more time outdoors. The magazine It’s Not about the Bugs will be a little bit of “how to” mixed with a whole lot of inspiration to do more things outdoors. “Nature gives us everything we need to be well; but it’s up to us to make the time to be in it,” says Cashman. It does not have to be grand wilderness, either. A view of trees even in an urban setting is beneficial. 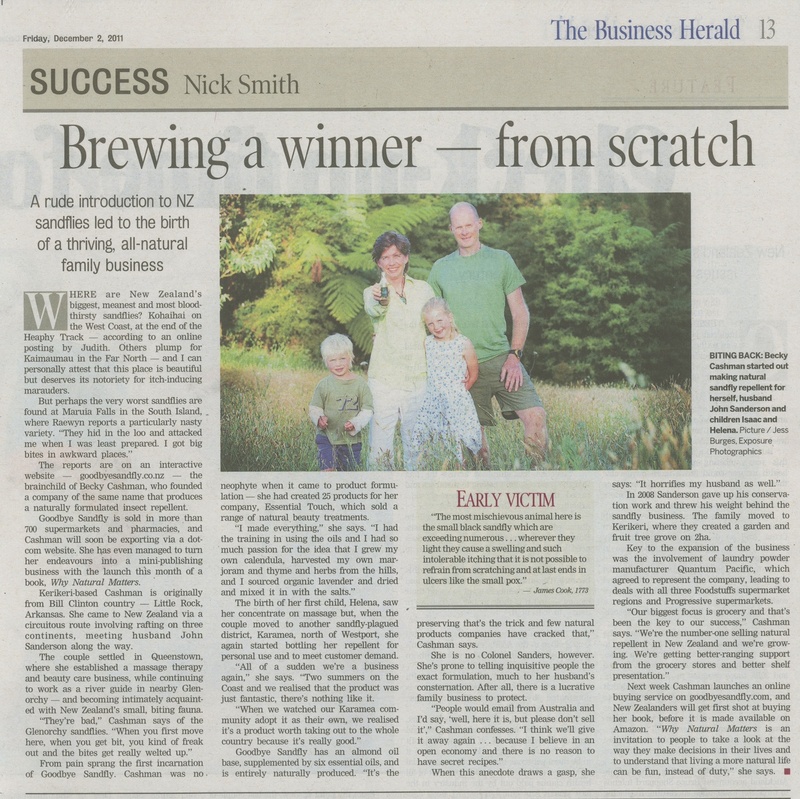 In July 2011 Natural bug repellent Goodbye Sandfly won the ANZ Flying Start Business Plan Competition for the Northland region. Becky Cashman director of Goodbye Sandfly says it’s exciting to see that their ideas are seen as unique and relevant to the current business environment. 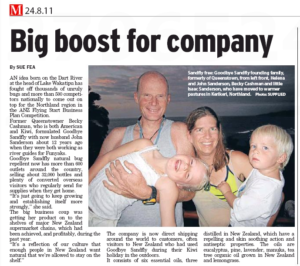 The NZ government business site states “In a nutshell, we’re looking for a viable business idea that is geared for growth, sustainable revenue, and can make a positive contribution to the local, national or global economy.” Cashman’s application to build Goodbye Sandfly into an iconic national brand hinged on their plan to publish a free weekly e-magazine celebrating the outdoors. 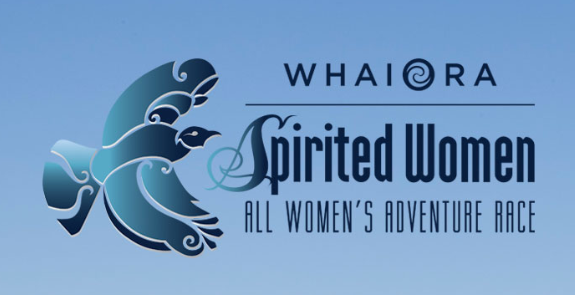 South Island brand quits Karamea summers & Queenstown winters and moves north. 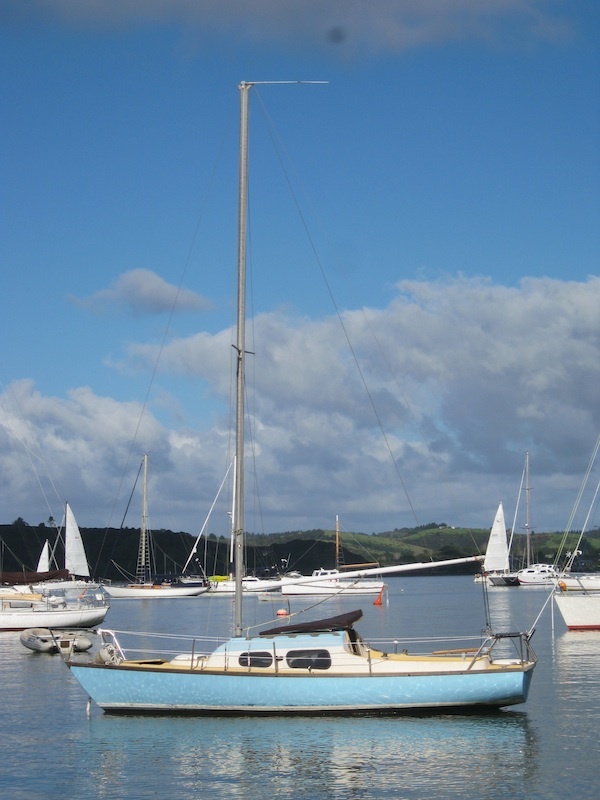 Attracted by volcanic soil and world class sailing country- we’ve bought 5 acres of land near Kerikeri in Northland. Our plan is to grow a whole lot of organic food. In John’s idea of the perfect lifestyle, he sussed out this beauty on Trade me, that went on auction for $1 reserve. 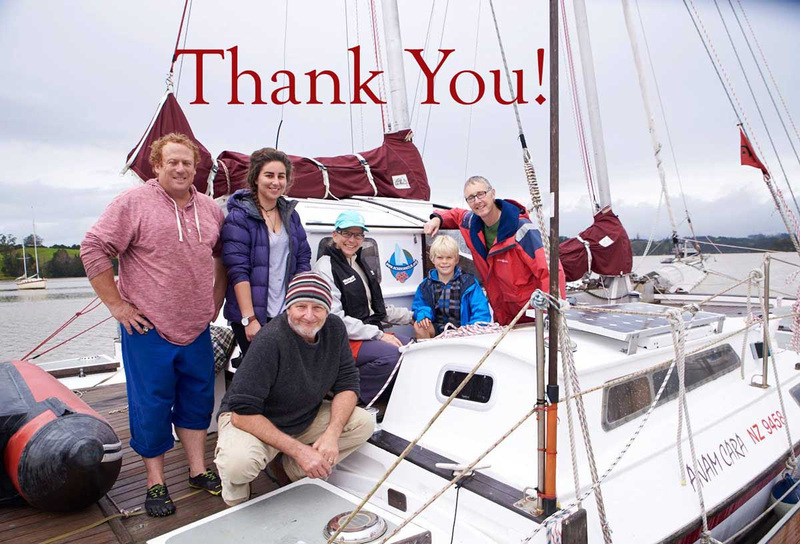 After duking it with out with 2 other bidders for 45 minutes on auto-extends, John got our 23 foot Compass Southerly “Sea Bond” for $2400. 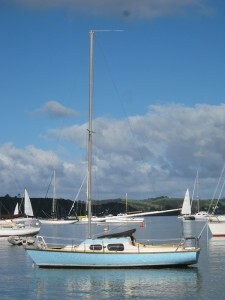 Sight unseen & based in Whangamata, John & friend then took a week and sailed it up to Kerikeri. Yep, she’s great! Goodbye Sandfly launches into Progressive’s chain of supermarkets Countdown, Woolworths & Foodtown, associated brands FreshChoice & SuperValue as well as Foodstuffs New World, Pak n Save & Four Square. Very busy month for the Sanderson house, everything shipped from our home! Goodbye Sandfly was formulated in 1999 during an ocean retreat. Becky loaded up all her essential oils and a layer empty small brown glass bottles in “Little Red”, a Mazda 323 and drove from Queenstown to the Catlins, on the east coast of the South Island of NZ. She worked with the oils, then when her nose became confused, she took walks on the beach and sang to the ocean. With John and Becky both working as guides for Funyaks on the Dart River, they were able to work with guests day after day to refine the formula. Guests quickly fed back what they liked, and the overwhelming top formula became Goodbye SANDFLY. Beyond the story of formulating in 1999, Goodbye SANDFLY grew steadily in the early years along with many other essential oil based products under a brand called Essential Touch. It ran alongside a massage therapy clinic run in Queenstown. The products business was closed down in 2004 because having a baby and running two businesses just didn’t quite hang together for Becky. In 2005, in anticipation of a move to the west coast of the South Island, Essential Touch became only Goodbye SANDFLY. By October 2007, John and Becky were bottling together at the kitchen table every evening in the weeks and months after their 2nd child was born. The following year, they began contract manufacturing Goodbye SANDFLY, which freed up the kitchen table to be a kitchen table. John joined the business in 2010 with the nationwide launch of the brand into grocery.